Pat O’Neill’s The Decay of Fiction screened at the 2003 Rotterdam International Film Festival. This is a festival that is often a showcase for innovative and non-linear moving image works, hard to catch elsewhere. It is commendable that the Melbourne Cinémathèque can bring such work to an Australian audience. O’Neill’s experimental film practice is grounded in a photographic and conceptual methodology. It is a practice that has somehow managed to nourish itself inside a tradition apparently alien to it: the mother of all media beasts, Hollywood itself. The Decay of Fiction mischievously posits itself on this fault-line more clearly than his earlier, feature-length work, Water and Power (1990, 57 minutes), and the shorter films dating from the mid-1960s onwards. This proximity is partly due to his choice of location (and main character): the abandoned and “soon” to be demolished Ambassador Hotel in Los Angeles. Dating back to the 1920s, this is the site of all kinds of American ghosts and Hollywood babble. It contains the now locked ballroom where Sirhan Sirhan assassinated Bobby Kennedy. The Hotel’s artificial interior palm trees are remainders from Valentino’s The Sheik. J. Edgar Hoover, Marilyn Monroe, Howard Hughes, Jean Harlow, John Barrymore and Gloria Swanson once lived there. The Hotel also houses the Coconut Grove nightclub where the ceremonies for the first eight years of the Academy Awards were held; where Joan Crawford, Carole Lombard and Loretta Young were discovered while dancing, where Bing Crosby began his singing career, and so on. Over the last 30 years numerous movies and scenes have been shot there. For generations of movie-goers and television consumers (with or against our wills) these names and events have seeped into our consciousness, have become our memories. They survive as a sea of traces within us. The Decay of Fiction suggests, at times, such a state of reverie as it takes us on a colour tour of the Ambassador Hotel’s nooks and crannies. Along the way we encounter transparent guests in black-and-white fragments of noir narrative. Honeymoon conversations, the voices of gangsters, detectives and staff breeze through. Strange creatures and abstractions appear intermittently, dissipating clusters of emerging story. As well as these half-familiar traces there is also a cavalcade of technique itself: time-lapse, collage and double exposure, amongst others, from which this film is assembled. This technique and its application are part of another language whose history has also shaped O’Neill (born in Los Angeles in 1939). He attended local L.A. film events that introduced him to the art of Deren, Anger and Brakhage, amongst others, and went to Art School at UCLA in the 1960s to study design and photography. In class in 1962 he was introduced to local experimental animator John Whitney, who was presenting one of his early abstract films, Catalog. Other influences included the local poet Wally Berman’s film posters, and as a teenager, car painter and pinstriper Von Dutch. O’Neill built several cars in his youth (1). O’Neill’s short films from the early 1960s onwards are highly graphic, layered and reflexive assemblages, based on a mastery of optical printing techniques. His work, from By the Sea (1963) to Sidewinder’s Delta (1976), explores the ambiguity of the image through technical manipulation and re-photography. His films develop a graphic language that deals with how different, often disparate elements assembled together in the frame relate to one another. These are the sort of aesthetic strategies also evident in Peter Tscherkassky’s recent film work and Robert Rauschenberg’s earlier collage art. In the era of digital compositing, the language of layering and collage so seamlessly enabled by such image producing software as Photoshop, has exploded over and into almost every music-video and cool magazine. As well as producing a distinctive body of work examining visual language in experimental film, O’Neill is connected to mainstream Hollywood via his successful special effects business. O’Neill’s company, Lookout Mountain Films in Los Angeles, has created the special effects for such mainstream films as Piranha (1978) and Star Wars Episode VI: Return of the Jedi (1983). In The Decay of Fiction these two faces of industry and art shift over each like tectonic plates. Such references back to the mainstream film industry and realm of narrative cinema more generally are easy to make in relation to O’Neill’s film. It is, however, also worth looking a bit more closely at where The Decay of Fiction fits within its own experimental, non-narrative tradition. The Decay of Fiction is in the tradition of the City Symphony (or City Poem) genre, relating substantively to such works as Dziga Vertov’s Man With A Movie Camera (1929), Walter Ruttmann’s Berlin: Symphony of a Great City (1927) and Joris Ivens’ Regen (1929). It can also be placed alongside Mike Hoolboom’s more contemporary Tom (2002), and Dominic Angerame’s five film, experimental feature-length compilation, City Symphony (1987-97). Angerame’s use of neighbouring city San Francisco’s Embarcadero Freeway as his partial subject in City Symphony has much in common with O’Neill’s use of the Ambassador Hotel in The Decay of Fiction. Both structures operate as emblems of decay and rupture that have outlived their function. The use of both structures also inserts a level of self-reflexivity into the filmmakers’ respective films. For Angerame, the freeway acts as metaphor for the film-strip while the Hotel in The Decay of Fiction acts as a metaphor for the camera itself (a monolithic camera obscura which O’Neill intermittently occupied and explored during the six years of the film’s stop/start making). The Embarcadero has now been dismantled but the Ambassador remains, patiently waiting its turn. Tom is an interrogation of the life and work of New York experimental filmmaker Tom Chomont. Hoolboom uses media images of New York City as a kind of equivalent to the enveloping bindings of a mummy, as a context and encasing for the unravelling of Chomont’s identity and memories, allowing for a kind of heavy-duty processing of the events of his life. O’Neill’s mark or presence is more that of an absent technical phantom in the operatic The Decay of Fiction. In Tom technique is used to expose and process identity, in The Decay of Fiction it is largely hidden. In this regard O’Neill has much in common with Australian experimental filmmaker Paul Winkler, whose virtuoso and emphatic use of technique is more about the erasure or suppression of identity than its elucidation. This erasure or suppression becomes its own truth. As a migrant “other” Winkler’s work graphically constructs an identity out of a debilitating tension with the overbearing 1950s ideal of the “New Australian”. Against similar odds, and as a creative “other”, O’Neill, in The Decay of Fiction, constructs an erased or suppressed identity from within a broom cupboard of the Dream Factory. Such moving assemblages conjure up technique as a form of armoury and shelter. For many an expressive and technologised – male – technique is an end in itself. It is the safe place in which identity can be placed. Such a tension between what is articulated and what is hidden can appear to promote ambiguity but it can also open a work up to multiple readings. O’Neill’s work seems to be able to do this very effectively – a sublime uncertainty opens up a fault-line of meaning. As he himself has stated: “[there is] a concern with perceptual ambiguity, with subjects whose presence has more than one explanation. Finding the point at which content is both unstable and balanced led me to the use of multiple images laid over one another”(2). The distance from the late surrealism of the psychodramas of the forties to O’Neill’s ad hoc universe is remarkable. The displaced objects and the uncanny juxtapositions of Deren, Anger and Harrington take on meaning from their relationship to the human figures that encounter them. As such they become symbolic functions. O’Neill, a native of southern California, seems to be telling us that such a symbolic and psychologically personalised landscape loses its significance in a space like Los Angeles which is so overwhelmed by fragmented representations and jerry-built perspectives (4). Decades after these observations, The Decay of Fiction (re-)captures this relationship to psychodrama. Deren, Anger and Harrington’s figures are represented by the black-and-white noir ghosts captured within O’Neill’s monolithic camera obscura. But also, remember if you can, that the fragmentation and jerry-built perspectives of 1970s L.A. have well and truly spread, have been further corporatised on a global scale. This is a backdrop that now describes a digital culture of fragmentation and surface, a pastiche world of parallel universes, multiple readings, of repetition and sampling, of the decay of fiction. O’Neill’s is a language jerry-built for the present. We can use it to erase ourselves from our own stories and landscapes. A mischievous message in a plate-glass bottle. O’Neill’s artistic practice straddles the history of photography and its antecedents. Is this work still relevant at the time of the photograph’s demise as a receptacle of truth and evidence? Is there a place for O’Neill in the new digital world of interactive multimedia? His work is made for it. What O’Neill was once doing to the photograph, everyone is now doing digitally. His multi-layered constructions have predicted the output of computer design. 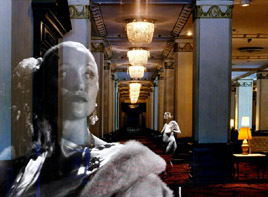 In fact, The Decay of Fiction is available as an Interactive DVD installation, and was showcased at V2 as part of the 2003 Rotterdam International Film Festival, along with a screening of the film itself. The DVD-Rom is called Tracing the Decay of Fiction: Encounters with a Film (2002). You decide which room you see next and how many times you listen to that familiar phrase: Who needs memory? Historically speaking, the rise of detective fiction at the turn of 20th century coincided with the arrival of the photograph as a technology at the centre of daily life. This technology captured everything that the roving eye missed, allowing the possibility of a second reading, and culturally enabling the persona of the eagle-eyed detective with a photographic memory to emerge as a modern hero. The detectives that enter the Hotel in The Decay of Fiction are not so lucky. They have been set a futile task beyond slapstick where they trip over their own existence and disappear. Who cares? Isn’t that the way it always was, before the photograph? We can go back further to Vermeer sitting in his camera obscura, copying a little house across the street (5). Perhaps the three women at the water trough in the lane, scrubbing the footpath and sitting at the doorway knitting, are really the same person, marking the different phases of the day Vermeer was in his closet drawing his “photograph”, being creative and mischievous with his technology. It’s even easier to do in Photoshop. 350 years later, in the Ambassador Hotel, O’Neill does the same. It is part of his tradition. For more background information about Pat O’Neill see David E. James, “An Interview with Pat O’Neill”, Millennium Film Journal, Fall 1997, 30/31, pp. 119–131. O’Neill quoted in James, p.120. P. Adams Sitney, “Saugus Series”, Millennium Film Journal 16/17/18, Winter 1986–7, pp. 158–161. See Philip Steadman, Vermeer’s Camera: Uncovering the Truth behind the Masterpieces, Oxford Press, Oxford, 2002.